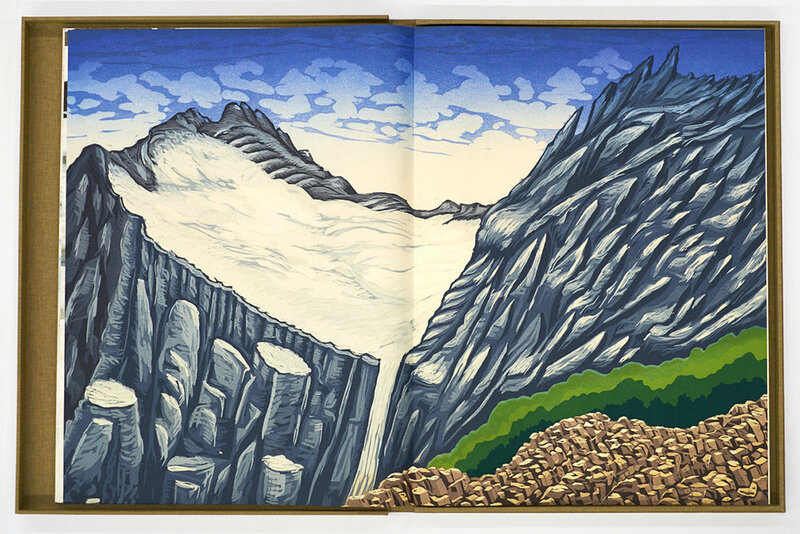 Congratulations to represented Artist Ian van Coller, who's artist books continue to gain critical attention; the New York Metropolitan Museum of Art, the U.S. Library of Congress, and the New York Public Library have all recently acquired van Coller's The Last Glacier. The book's focus is Glacier National Park, Montana, and has work by artists Todd Anderson, Bruce Crownover, and Ian van Coller. It is an elegant large-scale book that was hand bound in the Drum Leaf style by master bookmaker, Rory Sparks, and includes 13 reductive woodblock prints, 10 photographic prints, and is contained in a clamshell box. View a video flip-through of the book. All of the copies of The Last Glacier's editions have been spoken for, but beautiful related work exists. We recommend photographs by van Coller from the interior (see video flip-through for selection), or a related Artist's Book: Fissure, another well-collected book; Lundi, a book with intricate cutouts; or the forthcoming Kilimanjaro: The Last Glacier, an oversized book, are all wonderful alternatives. One of our personal favorites from The Last Glacier book, an image of Salamander and Gem Glaciers, is below.